Although it seems almost too obvious, one of my very favourite soups is the classic French onion soup. Rich and full of flavour, it’s best when topped with croutons made from toasted baguette, which are dripping with melted cheese. 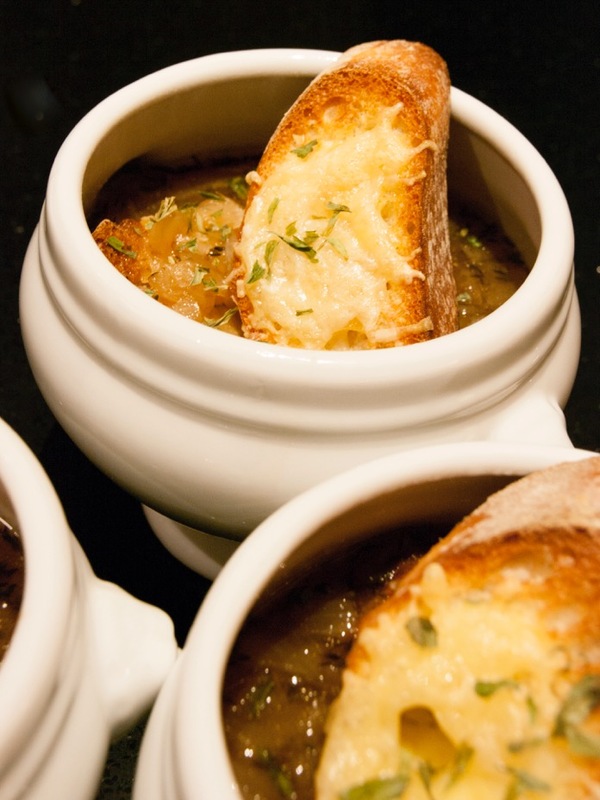 But while French onion soup is fabulous, it can be a bit of a bother to make. Chopping all those onions is tedious at best. At worst, it is an absolute tear-fest. Given this fact, I’ve been working on mastering a super quick, easy and tasty recipe for French onion soup that involves frozen onions. And, after a bit of practice, I think I’ve come up with a recipe good enough to share with all of you. So here’s my cheat’s version of French onion soup and I promise you won’t be able to tell that you didn’t chop the onions yourself! 2 cloves of fresh garlic, finely chopped. Or use a good shake of garlic powder instead. Melt duck fat or butter in large saucepan or stock pot. Add onions, garlic, thyme, sugar and seasonings and cook over very low heat until onion is lightly caramelised. Remember to stir regularly so your onion doesn’t burn. Turn up heat and add wine to pan, stirring to deglaze the saucepan, ensuring that all the yummy bits of onion are in your soup and not stuck to the bottom of your saucepan. Add beef stock and return soup to the boil. Check seasoning, but don’t over salt at this point in time. Simmer soup for around 20 minutes or until reduced to your liking. About 10 minutes before serving, slice baguette on the angle. You will need 8 pieces. Put the slices on an oven tray and pop the tray in the oven. Once the first side is golden, remove from oven, turn the baguette pieces over and top with a mixture of the grated cheeses. Return to oven and cook until the cheese is melted and slightly golden. To serve, place one piece of baguette in bottom of each soup bowl. Ladle soup into bowl, and top each bowl with another slice of cheesy baguette. Sprinkle the bowls with tarragon or parsley and call everyone to the table. Serves 4 people as an entrée or light meal.